Have you noticed how expensive it can be to buy maternity clothes? If you have ever been in the market to dress up your baby bump then I know you have noticed those crazy price tags! I remember with my second pregnancy, first baby, (long sad story, for another time maybe) I was about 20 weeks prego and my mom and I decided to go to the mall to start buying some maternity clothes. Of coarse our first stop was in one of those super cute maternity shops. Whoa! Sticker shock would be an understatement! I’m not sure about you but no matter how much money we are making in the future, I am not going to be spending that kind of money on my clothes! Especially clothes that will only fit me for about five months! I remember feeling a little sad thinking that I was only going to be able to afford maybe two shirts! How was that going to last me through me whole pregnancy? We decided to look elsewhere! Have you ever felt the same way? Don’t worry! I got your back! Or maybe I should say, I got your bump! (Cheesy! Sorry not sorry!) Today I am going to share with you all the tips I have used to save money on maternity clothes! I am not always a huge fan of buying clothes at a thrift store but when it comes to maternity it’s a great idea! Let me tell you why. In most cases, women barely use their maternity clothes for longer than 4 months. Most women don’t have more than two children (on average in the US). As a result, they have piles and piles of barely warn clothes just sitting around and they just want to get rid of them. Now if it were you or I, we would sell them to a consignment shop. You know, since we are frugal fabulous an all! But for most, they don’t think about this option and dump their barely warn clothes off at their closest thrift store. Their loss is your gain! The selection might not be huge but make sure to ask a store worker if they have a maternity section. Sometimes it can be hard to find. Make sure to go back often. Thrift stores have a revolving door when it comes to clothing. Who knows you might get lucky! This is probably my favorite tip I have. It’s my favorite because you have a really good excuse to go shopping and with this tip it’s not just for the next 9 months! You will be able to wear these cute clothes long after your sweet little one is here. 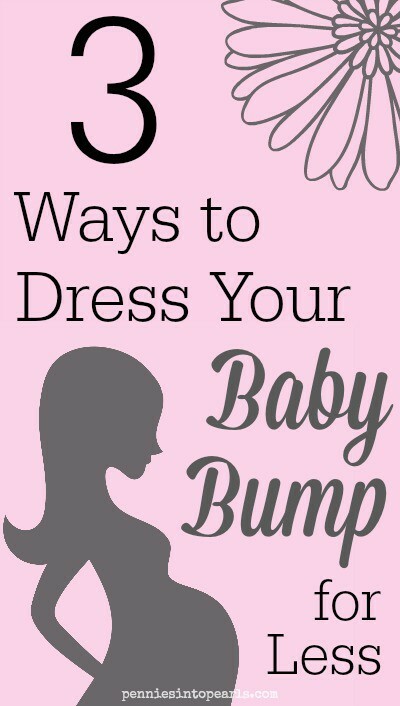 The very best items I love to buy to dress my bump are leggings and jersey nit skirts! Both of these items stretch and un-stretch really well! I have a few pieces of clothes that my bump has left a lasting impression on. But not my leggings or my skirts! I also have a new found love for kimonos. They are so light weight and comfy. Perfect for the summer! Even if it’s cold outside you can always buy fleece-lined leggings or wear some super warm fashionable tights under your skirts! Problem solved! Not only are these items going to look great all year on you but they are super affordable and can be found at almost any (non maternity) clothing store you go to! I am now about 22 weeks pregnant with our 3rd baby and my bump is coming in loud and clear already! I have been wearing the same leggings and skirts since day one and I am sure they will last me through my whole pregnancy. Money saved! Wait! Didn’t I just say to stay away from maternity stores? Kinda… But do you know what a consignment store is? Its an amazing place where people can bring in their gently used clothing, sell them to the store, then the store will fix them up a bit and resell them back to the public at a really fabulous price! First thing is they have so many really nice clothing pieces to choose from in all different sizes! A lot of other stores seem to have the same thing, t-shirts. Boring! But Motherhood Closet not only has shirts but they also have blouses, dresses, skirts, pants, active wear, swimwear and the list still goes on! You will have to check out the site to see everything they have! Worried about the size not being quit right? They have a very shopper friendly return policy, just make sure to keep those tags on! Motherhood Closet also has an amazing shipping time. Most of their customers receive their packages within 4 days! That’s just for standard shipping. Crazy right! So you get to sit in the comfort of your home, which is great because we all know shopping when prego is not the most comfortable thing to do, and you have plenty of options to choose for your baby bump wardrobe. I just bought some super cute bermuda shorts from Motherhood Closet and I plan on wearing them today! I can do that since I got them in the mail 2 days after I ordered them! Designer labels! Consignment shops are the perfect place to find designer labels for, seriously, fractions of the original price! Motherhood Closet is no exception! If you are looking for a specific brand, they have an entire section devoted to only designer brands usually priced at 50% or more below retail value! So now that you know how great Motherhood Closet is, don’t you want to go shopping? All frugal fabulous mamas want to look great! Here is your chance to win! The Prize: You could win a $25 gift card to MotherhoodCloset.com! The Rules: Contest is open to US residents 18 years and older only. Use the provided Rafflecopter form below to enter daily. Giveaway ends 04/03/2015 at 9pm PST. Winner will be notified via email. Winner must claim prize no later than 7 days after the giveaway ends. Thank you for the opportunity to win! This is awesome and the tips on saving are priceless!